Those were the words of Natalie Alcide, a young graphic communications student and valedictorian of her class at the New York City College of Technology (City Tech). If you’re an elder in your professional tribe, you’re doing your duty when your heirs speak in this way. I heard Natalie speak while attending the “Spring Fling” fundraiser hosted by the Graphic Communications Scholarship Foundation (GCSF). 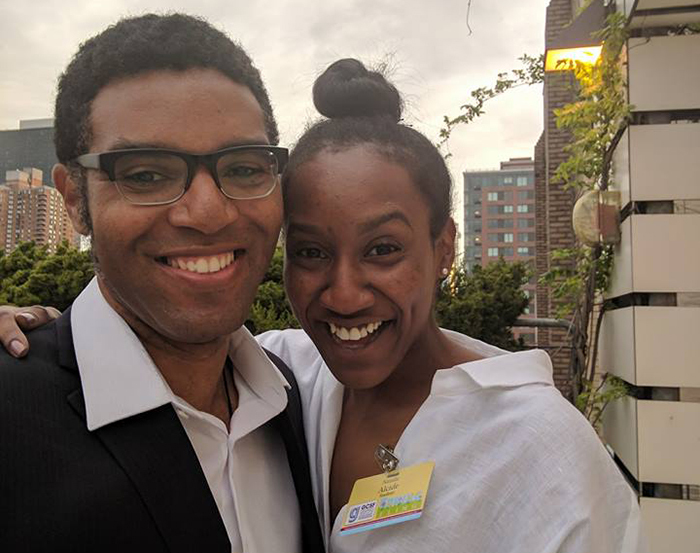 Held at the “Chocolate Factory” on the Oglivy and Mather rooftop, the Spring Fling was an opportunity to celebrate students like Natalie as well as the network of professionals who serve as their mentors. 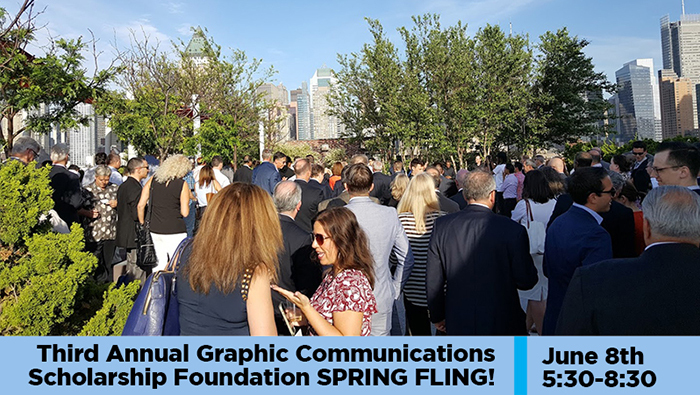 In addition to financial scholarships, GCSF provides graphic communications students in the New York region with opportunities to obtain direct experience and exposure across disciplines in graphic communication, printing, and publishing. Students visit companies, work internships, attend events, tour manufacturing operations, and most significantly meet and learn from established professionals. Natalie was introduced by Diane Romano, one of her mentors and a GCSF trustee. Diane was effusive in describing her mentee and said “with all of the new things she has introduced me to, I sometimes wonder who is mentoring who.” It was sweet, and a reminder of how kindness and giving back fosters futures far more appealing than what we produce with callousness and endless snark. So how about it, readers? Up for some giving back? In support of the second objective, below, you can read a short interview I conducted with Natalie after she addressed the Spring Fling crowd. Andy: How did you first come in contact with the Graphic Communications Scholarship Foundation? Natalie: I went to school on Long Island from first grade through tenth grade and then I transferred to New York City. It was like a day to night experience. In New York, I had no friends, no mentors, and no guidance. Then I met a man named Jack Kott who took me under his wing and said, “you have to apply for this scholarship.” He was a trustee for GCSF. So right out of high school I got my first scholarship from GCSF and I went to all of the events and all the seminars and all of it seemed like it was in a foreign language. Until eventually it started clicking. I became friends with these people. At one point, because I grew a lot with the organization, I was the only person under 30 in the room. Actually the only person under 25 in the room. So these people became my friends. They became my family. My mentors. They gave me my first internship. Opportunities. Everything. Once I transferred to City Tech, I found my passion for graphic communication design. I realized that GCSF had given me a little skin in the game that not all of the other students have. And I finally began to harness that. And now they can’t get rid of me. That’s what happened. Andy: What do you want to do? Natalie: What I want to do is art direction, particularly with a focus on social justice. It kind of started with my senior thesis project which was an advertising campaign to generate awareness on the stigma of anti-LGBT feelings in Hip-Hop. I took old school Hip-Hop lyrics, and using typographic and design treatments, I showed what was really going on and showed a new narrative. And I hope to open a conversation. It’s spiraled into helping my friend who just recently started a program where he goes to low-income neighborhoods and teaches students about financial literacy. He made me his director of communications. I help design the branding and all the videos. And I’m seeing where that will take me. In the fall, I will be starting grad school at City College for branding and integrated communications. Natalie: Thank you. In my head, I’m thinking “do you know what you’re doing?” But I feel like I’m on a path and I’m just going to ride the motorcycle. Andy: Yeah, you’re on your way. I’m swelling with happiness for you right now. Andy: So is there anyone in particular in the organization that helped you out? I know you talked about Diane Romano in your speech. Andy: Ha! OK, I’m going to tell him you said that. Natalie: Jack Kott who brought me in. David Luke. David Garcia. There are so many people. Nick Patrissi. What I’ve found with this organization is that everyone has their hands out wanting to give. Everyone at GCSF is eager to help the future of the industry so literally all you have to do is show up and they want to help you out. And that is amazing. That’s why I call this the best industry in the world because how do you come to an event like this and people just want to help you, they want to see you succeed. It’s amazing! When I first got in, I was doing sign-up sheets. I used to tell Jim Sewell, “I will help you at every single event’s table.” And what I would do is look at the name badges, put names to faces, and I would get their badges ready and I would say, “hey, such-and-such.” And that’s how I kind of made a name and people started to know me. This included people from the APC like Paul Nicholson and Jim Sewell. GCSF gave me a bridge to APC. APC is where I really found that my passion in this realm was going to be for social justice. This is your chance to get in on the ground floor with an emerging art director. You might be working for her soon. Follow Natalie on Instagram and Twitter. She’s also on LinkedIn, assuming you want to enhance this young person’s network and not bore her with unsolicited sales pitches. Click here to donate to GCSF. The “APC” Natalie mentioned is the Advertising Production Club of New York (APC-NYC), of which I am a member. In addition to supporting GCSF, APC-NYC provides continuing education, professional development, and industry networking for professionals in digital, traditional, and emerging media. Visit apc-nyc.org to learn more. By the way, via APC-NYC, I handled social media for the GCSF Spring Fling. You can see pictures from the event on the APC Facebook page (which you should go give a “like”). The person who made room for me in this community says “Print Long and Prosper.” Like her, we all prosper more when we invite younger people to prosper with us.